First impressions are important. We at Backcountry Journeys know this, and also subscribe to the notion that perhaps the fastest way to a person’s heart is through their stomach. This is precisely why each Canyons of Utah: Zion & Bryce Tour begins at the Rib & Chop House in St. George, Utah. It’s not really a matter of if you get a great meal there, deciding what to order is more of an exercise in choosing what you feel like being completely satisfied by on any particular evening. Following an orientation meeting, and dinner, our group happily retired to their respective rooms to dream about F-stops, landscape composition, canyons, and the promise of the days ahead. The morning sky – colored in pastel pinks and blues, accented by what Bob Ross would surely call “happy little clouds-” welcomed us to Zion National Park where the first shot of the trip would take place from the bed of the Virgin River. Our cameras were aimed primarily on Angels Landing, the world-famous block of Navajo Sandstone, grandstanding roughly 1,500 feet above the river valley. This tour was our hiking version, so following our morning shoot we ventured up Angels Landing Trail. This hike is strenuous, with a few steep drop-offs and some narrow sections. 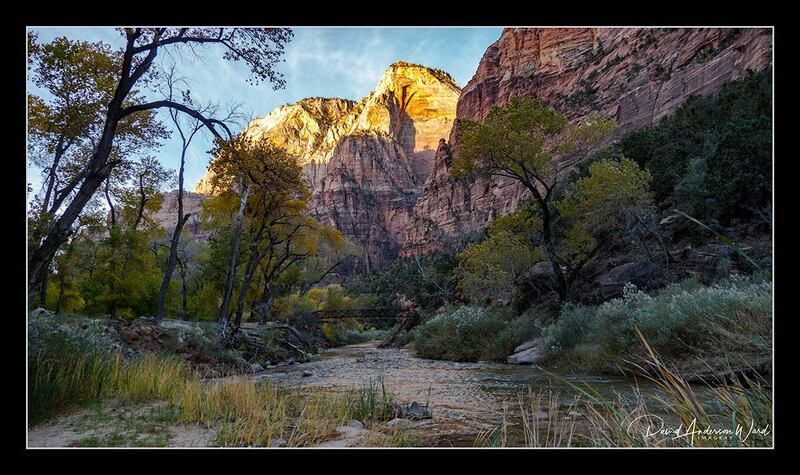 It is also the most popular hike in Zion. The trail led us up the 21 steep switchbacks of ‘Walter’s Wiggles,’ named for Zion’ s first superintendent, Walter Ruesch. The decision, after around 1,000 feet of elevation gain, was that the saddle would be our turnaround point, choosing not to tackle the infamous chains and knife-blade edges that lead up to the summit. The hike proved challenging, yet rewarding, for our group. Everyone handling it well. A sunspot on the valley below, as well as fall colors in Refrigerator Canyon were photographic highlights of the hike. Following the hike we caught a late lunch at Oscar’s Cafe, a Backcountry Journeys favorite. 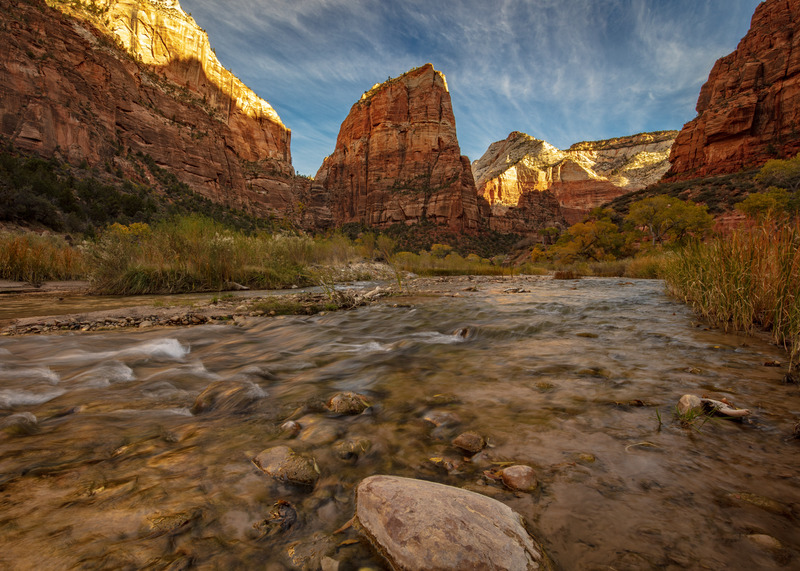 We love this spot so much that we’re sure to visit each time we are anywhere near Zion! There’s something about Oscar’s -it might be the portion size, it might be the cheesy goodness (we’ll keep testing hypotheses) – that typically leads to midday naps, so following lunch we took the opportunity for some downtime. The group reconvened at the Pa’Rus trail and captured the famous ‘Watchman.’ This is that classic Zion image we’ve all seen and lusted after, and while there were no clouds in the sky on this particular night, the crisp November sky provided a glowing ‘Watchman’ for the group. Day three began with the group dressing in unusual, rented, formal wear. This time of year we rent neoprene socks, canyon footwear, and dry pants in order to trudge comfortably through the Narrows. 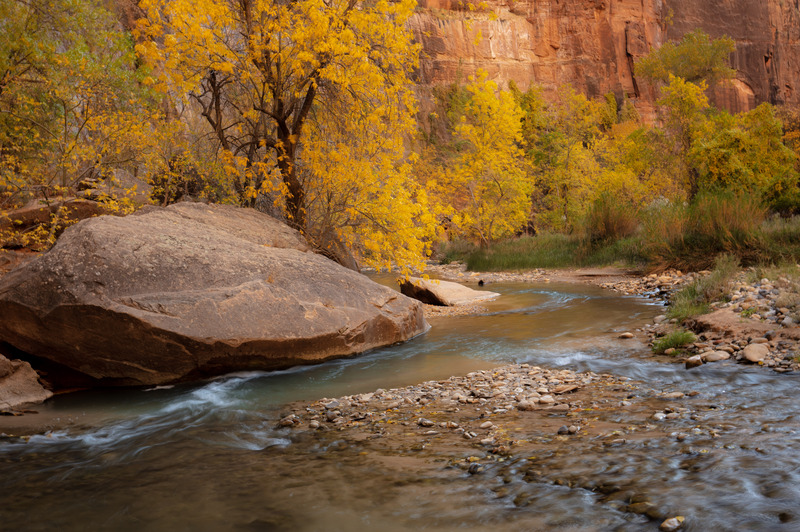 This section of the Virgin River has become world famous due to its sculpted sandstone walls and unique beauty. Sections of the sometimes 2000 foot high cliffs narrow down to just 20 – 30 feet wide, and the river is literally the trail here. This time of year the river is a chilly 55ish degrees -hence the waterproof pants and neoprene socks – Brrr!!!! The hike through Zion Narrows could arguably be the highlight of the entire trip for this group. Not selling short anything else on the itinerary, but this group’s impression of this impressional canyon had stoke levels bursting at the proverbial seems. Photos from this segment of the tour should prove to be outstanding, as the towering canyon walls, cool river, soft light and glowing colors opened the door for the creative process to truly thrive during the several hours spent in the Narrows. The Bit & Spur Saloon played host to the group for dinner, and it did not disappoint whether it was the chicken mole, ribs or smothered green chile burritos. We took the warmth from dinner with us out into the Utah night. Just outside of Springdale, at the end of a long gravelly road where ghosts still roam the countryside at night, stands the remains of the once-bustling town of Grafton. 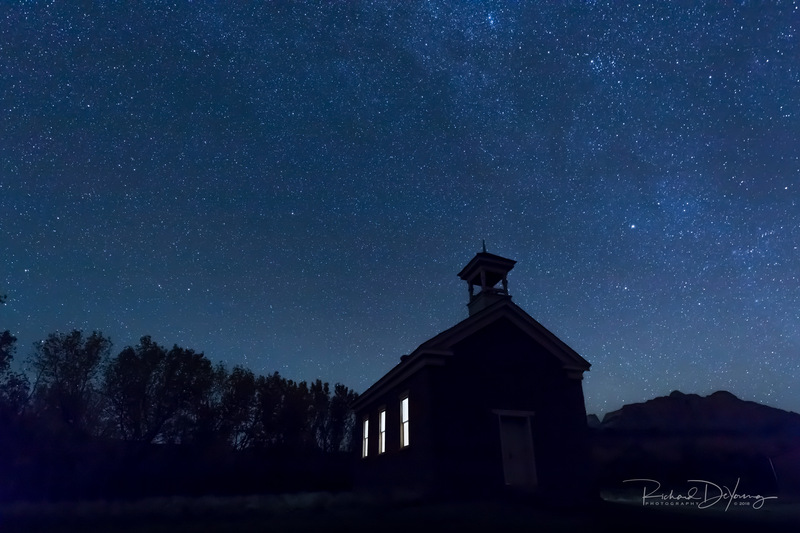 Somewhat forgotten, but not lost, the ghost town of Grafton played host to a night shoot for a group of Backcountry Journeys photographers on their final evening at Zion. We certainly appreciated the unique opportunity to learn and practice the art of astrophotography in a really unique setting. If you are a fan of old western film, you may have seen Grafton as it was used as the backdrop in movies such as Butch Cassidy and the Sundance Kid. Alarms were set extra early on our final day in Zion in order to make the hike up to Canyon Overlook prior to sunrise. The early wake up call, and hike, proved worthwhile as many in the group made some of their best images of the trip from perched high above the canyon valley with unobstructed views of the Towers of the Virgin. This breathtaking location includes the towering West Temple, and the Altar of Sacrifice. 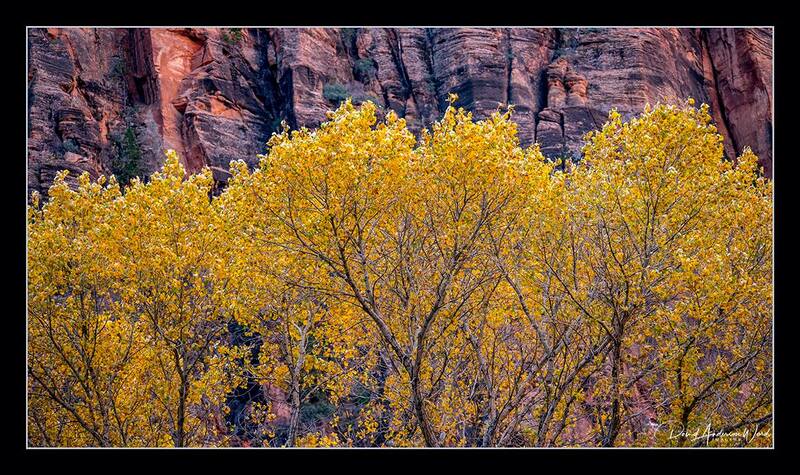 A simply perfect Zion morning scene. 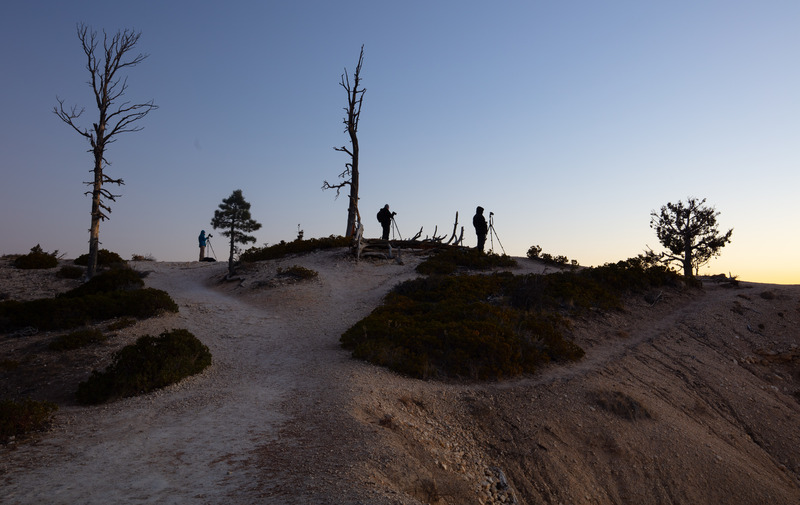 We followed Mr. Humphrey’s plan, so dark and early the next morning we perched ourselves at cold and windy Bryce Point. Perhaps no spot in the Park is better suited for sunrise than here. The full amphitheater is visible from this point, with the eastern horizon and then the tops of the hoodoos, set alight as if by fire from the first rays from the rising sun. The hoodoos take center stage here at Bryce Canyon. Water, ice and gravity are the forces at work on this landscape. It is these three forces combined with differential erosion of the rock that produces a different morphology than that of any other area in the world. Differential erosion happens here because the sedimentary rock is made up of varying rock that erode at different rates. The pink mud and siltstones erode much faster than the white limestone above. This causes the undulating and somewhat haunting shapes of the hoodoos. Hoodoo. What an interesting word. 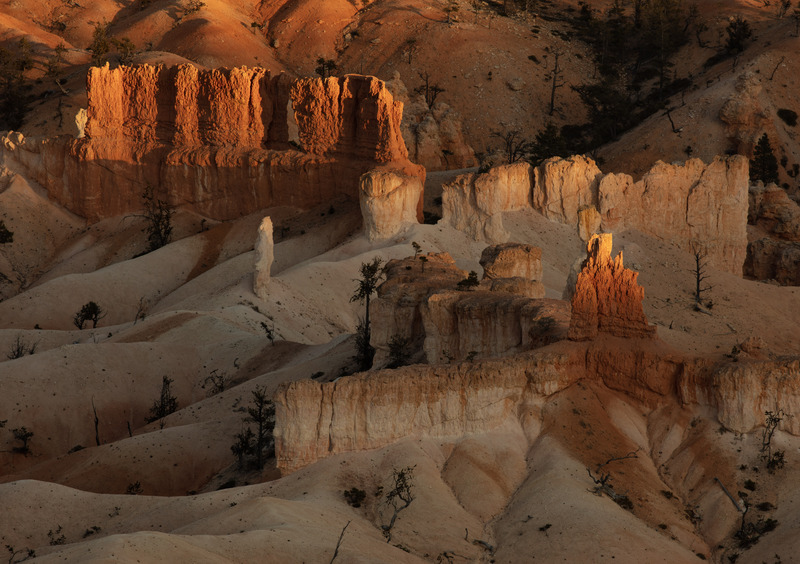 Kevin Poe, Chief of Interpretation at Bryce Canyon National Park tells the Kaibab Native story of the Hoodoos: The To-when-an-ung-wa, as they were called, were notorious for living too heavily upon the land. They would drink up all the water and eat up all the pine nuts. This was rude to the other animals of the woods as there would be nothing left for them to survive winter. For years and years this took place until the complaints of the other animals garnered the attention of the god, Coyote. Coyote decided to punish the greedy To-when-an-ung-wa through trickery. He invited them to a banquet and he promised enough food to be able to eat all day long. The To-when-an-ung-wa of course accepted Coyote’s invitation, and arrived to the dinner dressed in their finest, most-colorful clothing, or in their most elaborate war paint. As they sat down to Coyote’s great big banquet table, before anyone could take a single bite, he cast a spell on them that turned them to stone. The To-when-an-ung-wa tried to flee up over the top of the canyon rim, trampling on top of each other, writhing bodies trying to escape over the edge of the canyon, clustered right on the brink. And so here they stand to this very day stuck like rocks. The sunrise shot provided our test of cold weather resiliency (remember, photographers, sitting in harsh weather conditions is part of the job! ), and after thawing out we decided to allow temperatures outside to warm while we took time inside for an afternoon Lightroom classroom session back at our hotel, the rustic and historic Ruby’s Inn. Taking time to look at different Lightroom techniques was fantastic for the groups’ development as post production masters. Besides, what is more fun getting back from a shoot, then taking your brand new shots and making them look their finest? After our Lightroom work we returned to the Park for a hike and evening shot. We hiked the Navajo Loop, which is a 1.3 mile loop that travels down the Wall Street switchbacks and into the Bryce Amphitheater through a “slot” canyon where large Douglas Fir trees stand tall, reaching for the blue sky. The reds of the rock, greens of the tree tips and blues from the sky were fantastic contrasts! This hike allowed for the otherworldly hoodoos to become more real to us as we ventured past (and photographed) them. Once the cold returned and darkness fell, we moseyed back to our cozy quarters at Ruby’s so that group members who didn’t order the trout at the previous night’s dinner could amend for the error of their ways. The final day. The last of the shutter clicks. On the agenda for this day was one final sunrise shot at the aptly named Inspiration Point. From here we focused our lenses on the hoodoos one final time. It was seemingly much colder, but also less windy. We considered it a wash. Another cloudless sky enchanted with a glorious sunburst from the eastern horizon, hoodoos danced in the morning glow set against the backdrop of Boat Mesa and all was right with our world. After we had enough (could we ever actually have ‘enough,’ Rob? Ha Ha), memory cards gorged with images and hearts filled with happiness, we turned out sights back towards St. George. Our route via Utah’s scenic State Route 14 took us up and over Cedar Mountain, with views down Zion Canyon -and of of days past- from so high above. Until next time, Utah. Thanks for your hospitality and your lasting images!